Once again the eternal question, what to wear when you do not know what to wear? And the thing gets even more complicated when the rain makes an appearance: your hair curling, your pants get wet from the bottom no matter how hard you try to avoid it … And that’s not to mention how uncomfortable it is to go with the umbrella everywhere. But calm, we are going to ignore the saying and we are going to put a good face on bad weather; Yes, even on rainy and windy days you can look perfect if you follow these simple tips. Did you know that there are clothes and colors that you can wear to improve your mood and that of everyone who passes by? It is scientifically proven that wearing certain pieces and wearing specific colors, make your day less gray, so that’s where the first advice goes, leaving aside the idea that on rainy days you can only wear dark clothes. Red, pink, green, blue sky … And any other clear tonality that you can think of is ideal to carry in your clothes the days when the sky is covered with clouds. What’s more, try mixing an upper part in dark color with a lower part in light colors. The contrast will be worthy of admiration. Do not forget to take a look at the colors of the season. 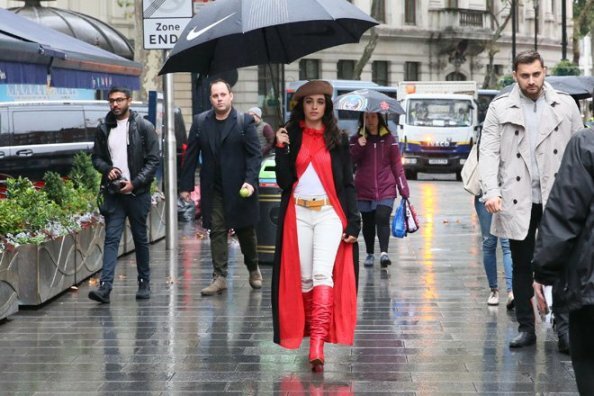 Following our tips for rainy days, we must tell you that you can opt for a total white look like Jessica Kahawaty with a red umbrella; for the blue shirt by Rihanna or by the black and white combination of Adwoa Aboah with transparent raincoat. As you can see, skirts are also allowed in the cold season. If there is something you should choose well, it is the boots. From the classic Hunter in black or red, to high heels and transparent midi boots. If you are going to spend some time in the street, leave aside the sneakers and leather shoes that can be damaged by water. Rebecca Hall is wearing white boots with a yellow raincoat; Rita Ora wears more traditional shoes and Alexa Chung boasts off-road Hunters. As for the rest of accessories, there are several options that you have, we advise you to wear a parka or a trench coat or a more elegant coat like the one that looks Sharon Stone; a maxi scarf and a shopper bag. Simple jewels and, of course, do not forget the umbrella that, as you have been able to see, is another ideal complement for this season.